Mary Malahy has been writing since 2006. She has written for "Coulee Region Women," "Today's Wisconsin Woman," "Milwaukee Family," "La Crosse Tribune" and the "Jackson County Chronicle." Malahy also copy edits for NOW newspapers. She has a Bachelor of Science in English and communication from the University of Wisconsin-La Crosse. Using an elliptical and running are two of the most common forms of cardio exercise. Traveling a mile using either activity will help you burn calories by raising your heart rate. While the two activities are comparable, they do have many differences and most people prefer one over the other. The elliptical facilitates a motion somewhat between running and riding a bike. While standing upright, your legs move in a circular pattern and your feet remain in contact with the pedals. Many ellipticals offer the option of incorporating your upper body by gripping the machine’s movable arms. Doing so will cause a pumping motion, similar to the upper body motion of running, but slightly more exaggerated. This burns a few more calories per minute. This movement is smoother than running, but overall very similar. Incline and resistance are the most influential elliptical settings. Increasing the elevation increases the slant of the foot pedals. Unlike running on a treadmill, increasing the slant does not make the exercise harder overall. Instead, it targets the glutes and hamstrings. Running at a lower incline targets the quads and the calves. You can either adjust these settings manually or choose a program in the beginning of your workout that meets your needs. For example, you can choose an interval program or a fat burn program. Running on a treadmill offers you many of the same options. In contrast, the only thing you can control while running outside is your speed. This is because your resistance is constant and is determined by your body weight. While your incline depends on the terrain you run on. Using an elliptical burns between eight and nine calories a minute, according to the American Council on Exercise. This is the equivalent to jogging at a pace of 11.50 minutes per mile. 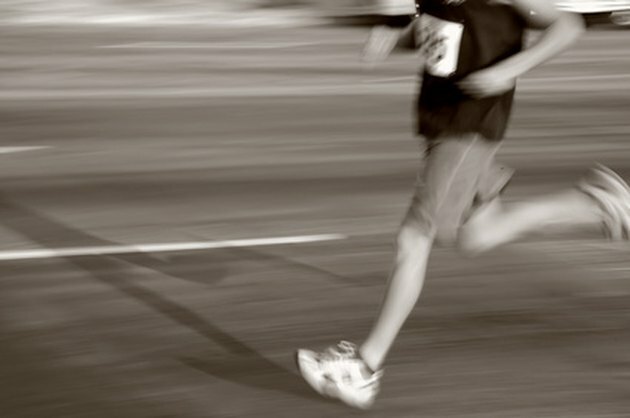 Running a mile at that pace will burn about 10 calories per minute. But, increasing speed and distance on the elliptical or using the upper arms can help you burn as many calories as you would running. Many people are drawn to the elliptical because it doesn’t put pressure on the joints. Because the foot stays in contact with the pedal at all times, there is no impact. This is attractive to many runners who have worn out their knees from pounding on pavements over the years. The elliptical does not develop new muscle because it does not require the body to apply pressure while moving but, it does tone existing muscle. Running does develop muscle. Developing a pound of muscle burns an extra 30 to 50 calories a day, which over the course of a year burns between 4 and 5 lbs.